Toronto summers can be sweltering hot. Lately, it's been crazy humid, sticky and hazy. Yesterday, I chose not to leave the house so as to not break a sweat. I guess the plus side is, I will be able to adjust to Italian summers just fine....well, actually, I take that back. Currently, I have the luxury of CENTRAL AIR. I'm not quite so sure I'll have A/C, or even a working fan once I move. One thing I love about summer is that there are so many amazing fruits in season. Being located in Ontario, we have access to fresh Ontario peaches and strawberries. Another delicious summer favorite fruit is watermelon, of course, mmm! 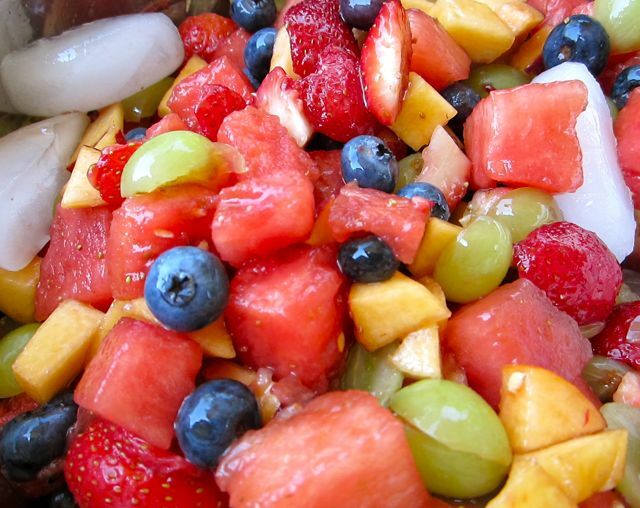 My mom has always been preparing summer fruit salads for us since we were children. In the past few years, I've taken over and been making my own variations. Apparently, this is a popular summer salad in Italia as well, but they call it Macedonia. Here's a little simple recipe for a refreshing, low-cal summer treat that you can enjoy for dessert, or even breakfast. It makes for a great potluck dish as well! 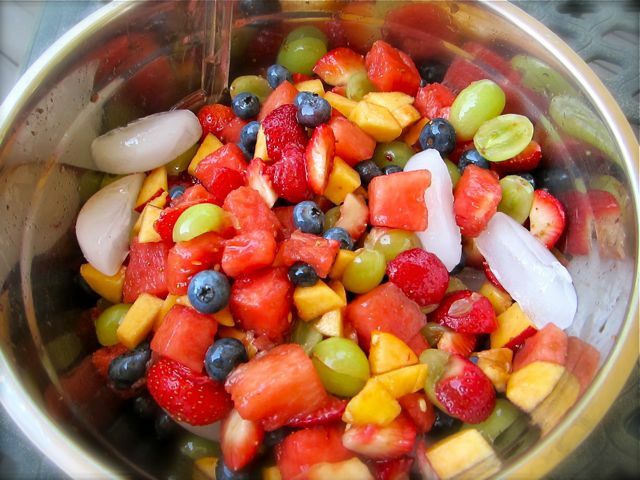 Take a large mixing bowl and mix all the fruit together gently with a large spatula until it is all mixed. Sprinkle the Sucanat evenly over all the fruit and continue to gently mix until it is dissolved and glazed over the fruit. For those of you who are skeptical about using this sugar, I guarantee it is equally as sweet, but much healthier. 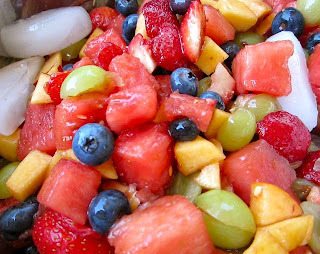 Remember, summer fruits are already naturally sweet, so adding white sugar doesn't compliment this type of salad in my opinion. Add the ice cubes on top and seal the bowl with saran wrap. Let the salad sit in the fridge for about 2 hours. The ice will melt and create a wonderful, sweet juice for the salad to sit in. Serves about 8 people, but can be stored for a few days in the fridge if you are making it fora smaller group.